The bed contains elements that attract butterflies, includingnectar plants, rocks for basking in the sun, and fresh watertrickling from a blue urn fountain. Provide food, and guests are guaranteed. It’s true for people, and it’s true for butterflies. Furnish your garden with nectar-rich flowering plants, and monarchs, swallowtails, and other winged visitors will drop by regularly, bringing beauty and motion with them. Add some larval plants for their caterpillar offspring to chomp on, and your butterflies won’t dine and dash ― they’ll stick around to mate and lay eggs. 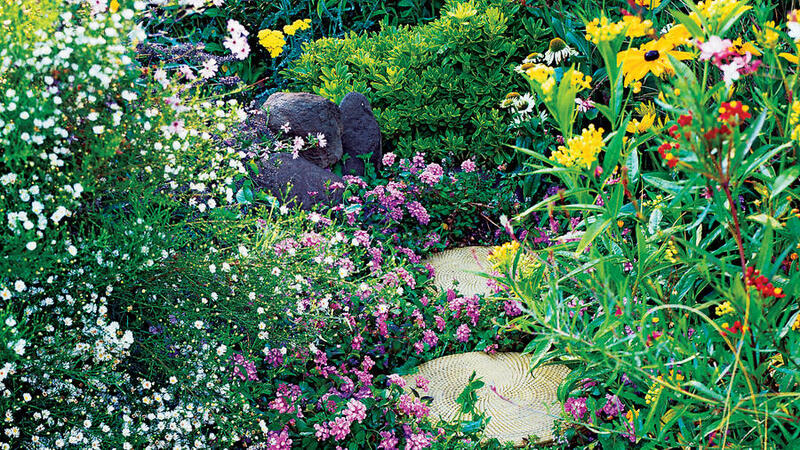 You don’t need a lot of space to create a butterfly garden. The one here, designed by Sunset test garden coordinator Bud Stuckey, measures just 8 by 10 feet. For ease of care, he used only perennials, no annuals. Most plants, including the asters, black-eyed Susans, and lantana, are nectar sources; larval plants include Asclepias and sedge. To make the area even more appealing to butterflies, Stuckey added an urn fountain for them to sip from and a trio of flat rocks where they can bask in the sun. Concrete pads invite human visitors to step into the garden. The pads, called Tuffits, are from Cottage Gardens of Petaluma (707/778-8025). You can save a bit of money by buying trailing lantana and thyme in 4-inch pots. Other plants listed are generally sold in 1-gallon cans.